What are eye allergy symptoms and signs? What is the basic anatomy of the outer eye? Why are the eyes an easy target for allergies? What are allergic eye conditions? What are eyelid allergies (also called contact eye allergies)? What conditions can be confused with eye allergies? What is the treatment for eye allergies? Are there home remedies for eye allergies? What is the prognosis of eye allergies? Is it possible to prevent eye allergies? Dr. Jay Woody is a diplomat of the American Board of Emergency Medicine, a Fellow of the American College of Emergency Medicine and is an Attending Physician at Parkland Health and Hospital System, Children's Medical Center of Dallas as well as several other north Texas facilities. He is a well-known and widely published authority in the field of emergency medicine and the former regional medical director of a freestanding emergency medicine practice. Most allergic eye conditions are more irritating than dangerous. Allergic or vernal keratoconjunctivitis may result in scarring of the cornea and vision problems. Itchy, watery eyes are probably allergic eyes. Topical antihistamine/decongestant preparations are effective and safe for mildly itchy, puffy, red eyes. Patanol, a topical mast-cell stabilizer, is a safe, highly effective, long-acting treatment. Topical steroids should be used with caution and under the supervision of an eye doctor (ophthalmologist). If in doubt about an eye condition, seek medical advice from a doctor sooner rather than later. Photophobia (sensitivity to light) can be associated with eye infections. Most causes of eye discharge are not serious and can be easily treated. The eyes are the windows to the soul because they reflect our state of mind. 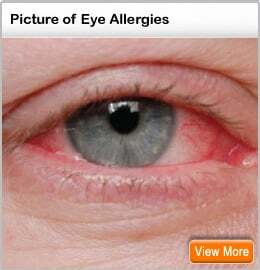 This certainly can't be true if our eyes are red, swollen, watery, and itchy from an allergic reaction. Severe allergic eye symptoms can be very distressing and are a common reason for visits to the allergist, ophthalmologist, and even the emergency room. Occasionally, severe eye allergies cause serious damage that can threaten eyesight. Typical symptoms associated with eye allergies include inflammation of the conjunctiva that is caused by a reaction to allergens. The inflammation causes enlargement of the blood vessels in the conjunctiva ("congestion"), resulting in a red or bloodshot appearance of the eyes. These allergy symptoms can range from very mild redness to severe swelling associated with discharge. Eye allergies usually are associated with other allergic conditions, particularly hay fever (allergic rhinitis) and atopic eczema (dermatitis). The causes of eye allergies are similar to those of allergic asthma and hay fever. Medications and cosmetics can play a significant role in causing eye allergies. Reactions to eye irritants and other eye conditions (for example, infections such as pink eye) are often confused with eye allergy. Any kind of irritant, whether environmental, infectious, or manmade, can cause symptoms consistent with eye allergies. Eye allergies mainly involve the conjunctiva, which is the tissue lining (mucus membrane) that covers the white surface of the eyeball and the inner folds of the eyelids. The conjunctiva is a barrier structure that is exposed to the environment and the many different allergens (substances that stimulate an allergic response) that become airborne. It is rich in blood vessels and contains more mast cells (cells that release histamine, a chemical mediator of allergic reactions) than the lungs. The lacrimal (tear) glands are located in the upper and outer portions of the eye. They are responsible for producing the watery part of tears, which keeps the eye moist and washes away irritants. The tears also contain important parts of the immune defense such as immunoglobulins (antibodies), lymphocytes (specialized white blood cells), and enzymes. The cornea is the transparent sheath in front of the lens of the eye. The cornea has no blood vessels and very little immune activity. When you open your eyes, the conjunctiva becomes directly exposed to the environment without the help of a filtering system such as the cilia, the hairs commonly found in the nose. Approximately 54 million people, about 20% of the U.S. population, have symptoms of allergies. Almost half of these people have allergic eye disease. People who are more susceptible to allergic eye disease are those with a health history of allergic rhinitis and atopic dermatitis and those with a strong family and/or personal history of allergy. Symptoms and signs usually appear before the age of 30. The scenario for developing allergy symptoms and signs is much the same for the eyes as that for the nose. Allergens cause the allergy antibody IgE to coat numerous mast cells in the conjunctiva. Upon reexposure to the allergen, the mast cell is prompted to release histamine and other mediators. The result is itching, burning, and runny eyes that become red and irritated due to inflammation, which results in congestion and discomfort. The eyelids may swell, even to the point of closing altogether. Sometimes, the conjunctiva swells with fluid and protrudes from the surface of the eye, resembling a "hive" on the eye. These reactions may also induce light sensitivity. Typically, both eyes are affected by an allergic reaction. Occasionally, only one eye is involved, particularly when only one eye is rubbed with an allergen, as this causes mast cells to release more histamine. Allergic conjunctivitis, also called "allergic rhinoconjunctivitis," is the most common allergic eye disorder. The condition is usually seasonal and is associated with hay fever. The main cause is pollens, although indoor allergens such as dust mites, molds, and dander from household pets such as cats and dogs may affect the eyes year-round. Typical complaints include itching, redness, tearing, burning, watery discharge, and eyelid swelling. To a large degree, the acute (initial) symptoms appear related to histamine release. The treatments of choice are topical antihistamine drops such as olopatadine (Patanol), decongestants, and the newer mast-cell stabilizer medications. Topical steroids should be used only if prescribed by a doctor for severe reactions and on a short-term basis because of the potential for side effects. In general, oral antihistamines like loratadine (Claritin) or cetirizine (Zyrtec) are the least effective option, but they are often used for treating allergic rhinitis together with allergic conjunctivitis. Rubbing itchy eyes is a natural response. However, rubbing usually worsens the allergic reaction due to the physical impact on the mast cells, which causes them to release more mediators of the immune response. Translation: Do not rub your eyes! Commonly called "atopic keratoconjunctivitis," this health condition is a notorious cause of severe eye changes, particularly in young adults. Atopic keratoconjunctivitis implies inflammation of both the conjunctiva and cornea. "Kerato" means pertaining to the cornea. This form of conjunctivitis usually affects males 3 times more frequently than females and may begin in late adolescence. It's peak incidence is in males aged 30 to 50. It is more common in those who had atopic dermatitis in early childhood. The condition is characterized by intensely itchy, red areas that appear on the eyelids. A heavy discharge from the eyes can occur, and the skin of the eyelid may show scales and crusts. In severe cases, the eyes become sensitive to light, and the eyelids noticeably thicken. If managed poorly, there can be permanent scarring of the cornea due to chronic rubbing and scratching of the eyes. This scarring can cause visual changes. The triggers for atopic keratoconjunctivitis appear to be similar to those of atopic dermatitis. A search for common food allergies, such as eggs, peanuts, milk, soy, wheat, or fish is important. Airborne allergens, particularly dust mites and pet dander, have been overlooked as a significant contributing factor and should be evaluated and controlled. The hallmark of treatment for allergic conjunctivitis is the use of potent antihistamines (similar to those used in atopic dermatitis) to subdue the itching. Topical antihistamines, mast-cell stabilizers, and the short-term use of oral steroids are all beneficial for relief of the itching. Occasionally, an infection of the area (usually with staphylococcus, commonly referred to as "staph") worsens the symptoms, and antibiotic treatment may help control the itching. Allergy shots are useful in selected cases. Atopic keratoconjunctivitis can lead to cataract formation in up to 10% of cases. In rare cases, blindness can occur. Vernal keratoconjunctivitis is an uncommon health condition that tends to occur in preadolescent boys (3:1 male to female ratio) and is usually outgrown during the late teens or early adulthood. (Vernal is another term for "spring.") Vernal keratoconjunctivitis usually appears in the late spring and particularly occurs in rural areas where dry, dusty, windy, and warm conditions prevail. The eyes become intensely itchy, sensitive to light, and the lids feel uncomfortable and droopy. The eyes produce a "stringy" discharge and, when examined, the surface under the upper eyelids appears "cobblestoned." A closer examination of the eye reveals severe inflammation due to the vast number of mast cells and accumulated eosinophils (a type of white blood cell involved in the allergic response), producing so-called called "Trantas dots." Improper treatment of vernal keratoconjunctivitis can lead to permanent visual impairment. The most effective treatment appears to be a short-term course of low-dose topical steroids. Topical mast-cell stabilizers and topical antihistamines can also be beneficial. Wraparound sunglasses are helpful to protect the eyes against wind and dust. Keratitis, or the inflammation of the cornea, in vernal and atopic keratoconjunctivitis is largely caused by a substance that is released from the eosinophils called major basic protein. This health condition is named for its typical feature, large papillae, or bumps, on the conjunctiva under the upper eyelid. These bumps are likely the result of irritation from a foreign substance, such as contact lenses. Hard, soft, and rigid gas-permeable lenses are all associated with the condition. The reaction is possibly linked to the protein buildup on the contact lens surface. This condition is believed, in part, to be due to an allergic reaction to either the contact lens itself, protein deposits on the contact lens, or the preservative in the solution for the contact lenses. Redness and itching of the eye develop, along with a thick discharge. Allergy to contact lenses is most common among wearers of hard contact lenses and is least common among those who use disposable lenses, especially the one-day or one-week types. Sleeping with the contact lenses on greatly increases the risk of developing GPC. The most effective treatment is to stop wearing the contact lenses. Occasionally, changing the type of lens in addition to more frequent cleaning or using disposable daily wear lenses will prevent the condition from recurring. The giant papillae on the conjunctiva, which are characteristic of GPC, however, may persist for months despite these measures. Eye medications, such as cromolyn (Opticrom) or lodoxamide (Alomide), often are used in this condition, sometimes for several months. Contact lenses should not be worn while these medications are being used. Contact eye allergies are essentially contact dermatitis of the eyelids. This is allergic inflammation of the eyelid from direct contact with certain allergens. Women in particular may experience this problem due to allergic reactions to preservatives in eye products and makeup (for example, eye creams, eyeliner or eye pencils, mascara, and nail polish -- from rubbing the eye with the fingers). Other irritants include common over-the-counter (OTC) ointments such as neomycin/bacitracin/polymyxin (Neosporin or Bacitracin) as well as contact lens solutions (especially if they contain thimerosal). Symptoms and signs that are similar to those of a poison ivy rash appear 24 to 48 hours after exposure to the offending agent. The eyelids may develop blisters, itching, and redness. The conjunctiva may also become red and watery. If the eyelids continually come into contact with the offending allergens, the lids may become chronically (long term) inflamed and thickened. The best treatment for eyelid allergies is avoidance of the sensitizing agent(s). Changing to hypoallergenic lens solutions, cosmetics, or topical eye care products is usually necessary. Application of a mild topical corticosteroid cream for short periods will probably help. As is the case with atopic dermatitis, it is important to treat any secondary bacterial skin infection that may develop. The following is a list of health conditions, the symptoms of which are commonly confused with eye allergy. Dry eye: This condition results from reduced tear production and is frequently confused with allergy. The main symptoms are usually burning, grittiness, or the sensation of "something in the eye." Dry eye usually occurs in people over 65 years of age and can certainly be worsened by oral antihistamines like diphenhydramine (Benadryl), hydroxyzine (Atarax), Claritin, or Zyrtec, sedatives, and beta-blocker medications. Tear-duct obstruction: This is caused by a blockage in the tear passage that extends from the eyes to the nasal cavity. This condition is also typically seen in the elderly. The main complaint is watery eyes that do not itch. Allergy testing will be negative in this case. Conjunctivitis due to infection can be caused by either bacteria or viruses. In bacterial infections, the eyes are often "bright red" and the eyelids stick together, especially in the morning. 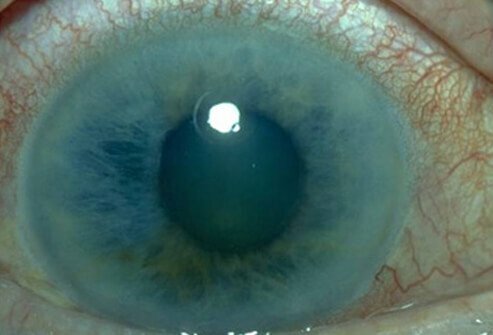 A discolored mucous discharge is often seen, so-called "dirty eyes." Viral conjunctivitis causes slight redness of the eyes and a glassy appearance from tearing. Adenovirus is a major cause of viral conjunctivitis. Herpes viruses, such as the varicella virus that causes chickenpox or shingles, can also affect the eye. Adenovirus infection is very contagious and may be spread by either direct contact, such as hand contact, or in contaminated swimming pools. You should seek medical attention if you suspect any of the above. If your eye itches and is "milky" red, it is most likely allergy. If it burns, it is probably dry eye. If it "sticks" in the morning and is bright red, it is usually bacterial or viral conjunctivitis. Most people with eye allergies treat themselves and do so quite effectively with OTC eye care products. Most commonly, home care consists of an allergy sufferer flushing the eye with water. With exposure to an allergen to the eye, it is important to thoroughly flush the eye with lukewarm tap water or commercially prepared eyewash solution. If these remedies are not working or if there is eye pain, extreme redness, or heavy discharge, you should seek medical advice. Some conditions, for example, are serious with potential sight-threatening health complications if required treatment is delayed. Moistening the eyes with artificial tears helps to dilute accumulated allergens and also prevents the allergens from sticking to the conjunctiva. Tear substitutes may also improve the defense function of the natural tear film. Antihistamine eye drops work by blocking histamine receptors in the conjunctiva. The histamine, therefore, is unable to attach to the conjunctiva and exert its effects. They are effective in relieving itching but have little impact on swelling or redness. They have two advantages over antihistamine tablets; there is a quicker onset of action and less drying of the eye. The new generation of topical antihistamines includes emedastine difumarate (Emadine) and levocabastine (Livostin). The side effects of these medications include mild stinging and burning of the eyes upon use, headaches, and sleepiness. But treatment with antihistamines at the point of irritation is still preferable than treating systemically with oral antihistamines if possible. Decongestants take the redness away as advertised. However, they do not help relieve itching. They act by shrinking the blood vessels on the conjunctiva. (They are not really effective against allergic eyes.) The decongestants oxymetazdine (Visine LR) and tetrahydrozoline hydrochloride (Visine Original) are available OTC. They do have a potential for abuse and should not be used by people with narrow-angle glaucoma, an eye disease characterized by elevated pressure within the eye. The prolonged use of decongestant nasal sprays can produce a rebound phenomenon in which the medication begins to cause more congestion than it relieves. This phenomenon rarely occurs in the eyes with the repeated use of decongestant drops. The mucous membranes of the eye are different from those of the nose. The eyes can become irritated and less responsive to the drops, but unlike the nose, the eyes tend not to develop "rebound" redness. Combination antihistamine-decongestant preparations can provide quick relief that lasts a few hours. They lessen the itch, redness, and swelling and are very useful for milder symptoms. Common combinations include pheniramine with naphcyoline hydrochloride (Naphcon-A or Opcon-A) and antazoline with naphazoline (Vasocon-A). Side effects are minimal, but the drops may become less effective if used for prolonged periods. They do have a potential for abuse and should not be used by people with narrow-angle glaucoma. Mast-cell stabilizers prevent the release of chemical mediators of inflammation from the mast cells. These are effective for all eye allergies. The first of this class of drug was cromolyn sodium (Crolom or Opticrom), which is available OTC. This topical medicine has been effective for treating mild cases of vernal keratoconjunctivitis and probably mild allergic rhinoconjunctivitis and has no significant side effects. It does have a slow onset of action. The newer agent, lodoxamide (Alomide), is 2,500 times more potent than Crolom and has a faster onset of action. This prescription medicine may be used in children older than 2 years of age and has minimal side effects. One disadvantage is the need to use the drops four times a day, and long-term use is necessary to prevent symptoms. The most effective mast-cell stabilizer, which also has antihistamine properties, is olopatadine (Patanol). Available by prescription, it is 250 times more effective than Alomide in relieving itching and redness. This drug provides rapid relief of itching and burning eyes. It can also prevent symptoms when used before an exposure or before the pollen season. The drops are very comfortable in the eye and can be used in children as young as 3 years old. The longer duration of action allows dosing of twice a day. Another new product, ketotifen (Zaditor), also has dual mast-cell-stabilizing and antihistamine effects. It dramatically reduces itching and redness and gives more rapid relief within minutes. Nonsteroidal antiinflammatory drugs (NSAIDS) are particularly useful in treating itchy eyes. They reduce redness and swelling to a lesser degree. Ketorolac (Acular) is a topical NSAID, which may cause temporary stinging and burning in 40% of users. Steroid antiinflammatory eyedrops are very effective in treating eye allergies, but they are reserved for severe symptoms that are unresponsive to other treatments. They must be used with caution in people with bleeding tendencies because they can increase the bleeding risk. Since there are significant risks with long-term treatment, their use should be supervised by an ophthalmologist. Caution must be taken, however, because of the potential side effects of the long-term use of steroids, even in eye drop form. Side effects of steroids include elevated pressure in the eyes and cataracts. The elevated pressure in the eyes can become glaucoma and lead to damage of the optic (eye) nerve and loss of vision. Cataracts are a clouding or opacification of the clear natural lens within the eye, which can interfere with vision. The purpose of the lens is to focus the light or images that enter the eye. Remember, however, that the side effects of steroids usually occur with long-term use and that steroid eye drops may be very effective when used over the short term. Loteprednol etabonate (Alrex) is a short-acting steroid with fewer side effects that shows great promise in the treatment of allergic eye disease. Topical steroids may cause or worsen glaucoma and result in cataracts with long-term use. About 500 drops of a high-dose preparation can cause cataracts. Also, remember that with topical steroid eye drops, short-term, low-potency preparations are recommended and should only be used under the supervision of an ophthalmologist. Oral antihistamines, either OTC or prescription (non- or lightly sedating), may be used for itchy eyes. The OTC products may cause drowsiness, and both can cause drying of the eyes. In general, treating topical conditions with topical medications is preferable. When avoidance of offending allergens and local treatments are not effective, allergy shots may be indicated. Your allergist may suggest this form of treatment when other measures have been unsuccessful. Eyes that are dry may aggravate eye allergy symptoms. Tear substitutes, such as artificial tears, are an often forgotten but are an effective lubricant. Cold compresses may help, particularly with sudden allergic reactions and swollen eyes. Keep eyedrops refrigerated since this makes application more soothing. The prognosis is favorable for most patients with eye allergies. Typically symptoms clear up quickly with OTC/home treatment or when the offending allergen is not present any more. Unfortunately the symptoms may reoccur depending on the cause of the eye allergy. Health complications are very rare, but medical attentions should be sought immediately for any pain or vision loss that occurs or for symptoms that do not resolve within 12 hours. Avoidance is the cornerstone of allergy treatment. It is particularly important to avoid both airborne and contact allergens. Remember, rubbing your eyes is a physical trigger and therefore care should be taken to avoid this. Chang-Godinich, Anne. "Atopic Keratoconjunctivitis." Medscape. Mar. 17, 2015. "Eye Allergy." American Academy of Allergy, Asthma & Immunology. What treatment do you use for your eye allergies or allergic eye disease? Why do you think you developed an eye allergy? Did treatment help? What symptoms do you experience with eye allergies? Do you have other allergies? Do you have eyelid allergies? What were your symptoms? Have you found a helpful treatment? Please describe your experience with eye allergies. What are the triggers for your eye allergies? How do you prevent them? Hashimoto's thyroiditis or chronic lymphocytic thyroiditis, is an autoimmune disorder causing inflammation of the thyroid gland. Hashimoto's thyroiditis is a type of hypothyroidism, and is the most common cause of hypothyroidism in the US. Symptoms of Hashimoto's thyroiditis may include dry skin, fatigue, weight gain, feeling cold, excessive sleepiness, dry skin, dry coarse hair, difficulty swallowing, a lump in the front of the throat, muscle cramps, mood changes, vague aches and pains, problems concentrating, leg swelling, constipation, and depression. There is no cure for Hashimoto’s thyroiditis. Diet changes, natural supplements, vitamins, or other natural products will not treat Hashimoto’s thyroiditis. Treatment for the autoimmune disorder is with thyroid hormone replacement therapy, which will be necessary for the rest of the person’s life. Indoor allergens are substances that can cause an allergic reaction in some people. Common sources of indoor allergens include dust mites, cockroaches, molds, pets, and plants. Avoiding indoor allergens is one way to reduce allergy and asthma symptoms. Clogged sinuses and congestion bothering you? Nasal irrigation can relieve sinus symptoms associated with colds and allergies. Learn how to do nasal irrigation with this visual guide from WebMD. Pinkeye, also called conjunctivitis, is redness or irritation of the conjunctivae, the membranes on the inner part of the eyelids and the membranes covering the whites of the eyes. These membranes react to a wide range of bacteria, viruses, allergy-provoking agents, irritants, and toxic agents. A sty is a bump that forms on the eyelid as a result of a blocked gland. Styes may be caused by infections, burns, or trauma to the eyelid. Most styes resolve on their own. The application of warm compresses can speed healing. In some cases, steroid injection or incision and drainage may be necessary. Keeping the area clean and consuming a diet high in omega-3-fatty acids may help prevent the formation of styes.